Consultants to public companies, brokers, attorneys, regulators and OTC Markets Group, Inc. This is what happens when a dubious company, i.e. Rainmaker Worldwide, Inc. (RAKR) hires a clown of an attorney with the intention of intimidating me. The company--Rainmaker--ends up looking even more sketchy. This is also what happens when a clown of a lawyer sends me a threatening letter without doing his due diligence. On Friday, March 16th I received an emailed letter from attorney Arthur S. Marcus, of New York law firm, Sichenzia, Ross, Ference Kesner, LLP. The next day, I picked up the original sent via FedEx. Me thinks that Marcus is about to regret sending it. Upon receiving his letter, I responded by email and I called Mr. Marcus. Like your typical bombastic New Yorker, he tried to push his weight around with some loud talk, over talk and aggressive tones. To say the least, that crap doesn't work with me. I intimidate lawyers, they don't intimidate me. Marcus would have been smart to check me out before he wrote this pack of lies. Yes Arthur, I am calling you a liar. Note that he is responding to my March 12th follow-up blog post on RAKR, the foiled pump and dump scheme designed to enrich a few of the boys connected to the company. Here's my favorite quote from the letter. I have brought your post to the attention of our contacts at the General Counsel's office of the OTC Markets who advised me that you have not beeen working in any capacity with OTC Markets and they share our concerns that you have posted that "Nearly 5 months after OTC Markets Group and I took down the pump and dump campaign then being waged on shares of Rainmaker Worldwide, Inc. ". Again, to reiterate OTC Markets has advised us that they were not and are not working with you in any capacity. Your statement is apparently a fiction designed to give your defamatory claims credibility. Attorney Arthur S. Marcus is a liar. I immediately forwarded Marcus the link to OTC Market's own press release and then called him. Rather than admitting that the jig was up, he doubled down on his lie, claiming that he found the press release interesting since he himself spoke with the General Counsel and that SHE claimed that I had nothing to do with OTC Markets Group. Arthur, you should know that the General Counsel for OTC Markets Group is Dan Zinn, who is most definitely not a "she". He is also the guy who signed my contract with OTC Markets Group, you stupid moron. Immediately after speaking to Marcus on the telephone, I forwarded the letter to Dan, the only General Counsel at OTC Markets Group, and he stated that he never spoke with anybody at Marcus' law firm about this. He also made it clear that nobody from his office had spoken with Marcus or anybody else at the firm regarding me or my article. "We do not intend to address each specific misstatement...", which translated means, because there are none, "including the false implication that the Company is late on its financial statements". Well, it is late Arthur, if you go by the fact that it's been four months since RAKR has filed a financial statement, but OK, if I'm wrong do you think that you could try and hang your hat on that one for a defamation suit? Besides, why is RAKR trying to raise money without filing current financials, and why do they use share counts from last June in their presentation package? Could it be to deceive potential investors? It sure looks that way. On behalf of the company, we hereby request you to cease and desist from publishing false and defamatory statements about the company particularly wherein you falsely implying [sic] that you are somehow working with the OTC Markets Group. I also note that your postings lack the required SEC disclosure as to your position in the Company's securities (no doubt short). I haven't made any false and defamatory statements. To the contrary, it is you yourself, Arthur, that is making false statements. And now everybody knows that you are a liar. As to my purported lack of statement regarding my position in RAKR, my original post did have that exact disclosure. Disclaimer: Although I consult for OTC Markets Group, they had nothing to do with this report, nor did they sanction me to conduct my investigation or write this report. The decision to apply a Caveat Emptor tag on Rainmaker stock or any other action deemed appropriate by OTC Markets Group, is not discussed with me in advance. I do, however, discuss certain independent findings on companies with certain parties at OTC Markets Group, as I do with the SEC, FBI or other regulatory bodies or authorities. I hold no position in any of the companies mentioned and never have. Perhaps Arthur, you should have read that post before lying yet again. And for the record, that disclosure still stands. Don't think, Arthur, you're not good at it. I have never, ever shorted any stock in my entire lifetime. And in spite of Marcus' accusations to the contrary, I want nothing from the Company. I wrote these articles about Rainmaker Worldwide, Inc. because of the potential risk to investors. I have being warning investors about pump and dump schemes for 15 years. ...if you persist in your false postings, we intend to commence an action against you for defamation and for damages against the Company. No you won't and I love SLAPP suits! We will also bring your actions to the attention of the SEC and other regulatory bodies. Don't bother, Arthur. As you now know, I already have. 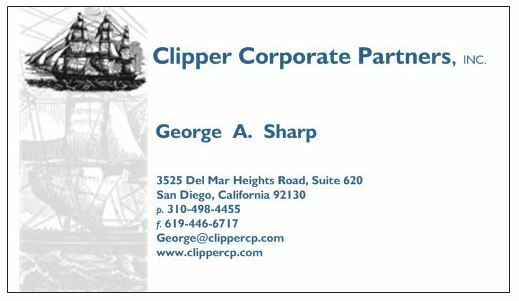 Any investment or legal opinion appearing on this site is strictly the opinion of Clipper Corporate Partners, Inc. and/or George Sharp who are not licensed brokers or investment advisors. George Sharp is not licensed to practice law and therefore cannot offer legal advice. Litigation consultation services are offered to attorneys only.